This isn’t new: everyone knows and has always known that the best doctors and the best healthcare in the world are to be found in the United States. Which is why, when the chips are down, the United States is precisely where they all come for treatment. No, the reason this particular story is a little more interesting than the usual traduce-America’s-health-care-system-until-you-get-seriously-sick scenario is that Saudi King Abdullah reportedly phoned Obama the day after Obamacare was forced through congress (via the unlawful use of the reconciliation process) and congratulated him on its passage. 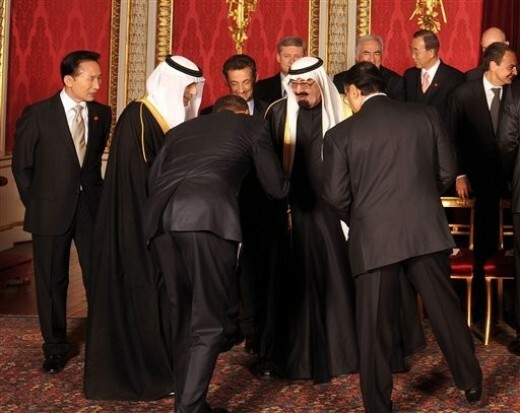 The day after the Obamacare law passed, Saudi King Abdullah reportedly called President Obama to congratulate him. The bill, it seems, was one more step toward the US embracing a superior universal health care system like that which can be found in Saudi Arabia, where treatments for medical problems such as, oh, say, blood clots, are fully covered. RIYADH, Saudi Arabia – Saudi Arabia’s aged ruler will fly to the United States for medical tests over a blood clot, according to a Saudi official, in a development that would renew questions about succession in the oil-rich kingdom. The 86-year-old King Abdullah is set to leave on Monday, three days after he was admitted to the hospital suffering from back pain due to a blood clot, the official said late Saturday. The official didn’t say which hospital would receive the king. To paraphrase John McCain’s question, when Obamacare is fully implemented in America, where will rich Saudis go for health care? Hooray for the king. let’s not jump to conclusions here. our president will go into history as one of the great presidents the usa ever had. mrs palin on the other hand will be known as the chief executive clown of the rep/tea party. healthcare in america is average compared to other countries in the world. we have a number of healthcare centers that are excellent and are at least equal if not better than any other place in the world. drawing the conclusion that our healthcare system is the best in the world is a simplification worthy of any tea party-ist. anyone claiming this has to be considered as being ignorant of the facts and as not having the foggiest idea of the reality outside the usa (where people live longer). healthcare in america is excellent for those who can afford it. at best the not-so-rich are getting average healthcare with a lot of medical mistakes unheard of in the other developed countries. the very rich can indeed afford the very best and this situation is expected to increase as ‘trickle down economics’ will gain a foothold again. now, am i a communist? not at all. i am not even a socialist. however i do believe it to be a government responsibility to ensure that healthcare at a reasonable cost is available to every citizen. that does not mean that healthcare has to be provided by the government. obama-care is not perfect and our president is the first person to recognize that the law needs some serious tweaking. by the way anyone calling the passing of this law ‘unlawful’ should think twice. it is so easy to use slogans to manipulate the ignorant masses. Seriously, JO? That’s what Ray Harvey does does best. Jungle Orchid wrote: > let’s not jump to conclusions here. our president will go into history as one of the great presidents the usa ever had. Jungle Orchid wrote: > mrs palin on the other hand will be known as the chief executive clown of the rep/tea party. The Supreme Court never ventured into the issues of redistribution of wealth, and of more basic issues such as political and economic justice in society…. To that extent, as radical as I think people try to characterize the Warren Court, it wasn’t that radical. It didn’t break free from the essential constraints that were placed by the founding fathers in the Constitution … that generally the Constitution is a charter of negative liberties. Says what the states can’t do to you. Says what the Federal government can’t do to you, but doesn’t say what the Federal government or State government must do on your behalf, and that hasn’t shifted, and one of the, I think, tragedies of the civil rights movement was, um, because the civil rights movement became so court-focused I think there was a tendency to lose track of the political and community organizing and activities on the ground that are able to put together the actual coalition of powers through which you bring about redistributive change…. I’m not optimistic about bringing about major redistributive change through courts… The Constitution reflected an enormous blind spot in this culture that carries on until this day … The Framers had that same blind spot … the fundamental flaw of this country. So if we’re going to talk about chief executive clowns here, I suggest we start with him, since he is far more clownish and possesses far more power than Sarah Palin. Jungle Orchid wrote: > we have a number of healthcare centers that are excellent and are at least equal if not better than any other place in the world. drawing the conclusion that our healthcare system is the best in the world is a simplification worthy of any tea party-ist. Ignoring the mind-spinning medical innovations, the medical breakthroughs, the technologies, the surgical procedures and transplants, the cures, the inventions, the drugs, the hospital facilities, the ambulances, the equipment, and so much more, which America alone has accomplished on a greater scale and in a vastly shorter span of time by light years than any civilization has accomplished ever in world history is a simplification worthy of any socialist. This piece, written by an erudite doctor who has practiced under both the Canadian system and the American system, explains how capitalism fosters medical innovation, just as it fosters innovation in every other realm of human endeavor, and for the exact same reasons. Conversely, this article, written by Doctor Yuri Maltsev, who was for many years a part of Mikhail Gorbachev’s economic reform team, shows us exactly what cradle-to-grave, government-run healthcare is actually like. It isn’t pretty. The raven chides its own blackness. Jungle Orchid wrote: > outside the usa (where people live longer). Comparing statistics among countries can be tricky, but in the case of infant mortality figures, the comparisons are downright treacherous. For starters, different countries count differently. According to the World Health Organization (WHO) definition, all babies showing any signs of life, such as muscle activity, a gasp for breath or a heartbeat, should be included as a live birth. The U.S. strictly follows this definition. But many other countries do not. Switzerland, for instance, doesn’t count the deaths of babies shorter than 30 cm, because they are not counted as live births, according to Nicholas Eberstadt, Ph.D., Henry Wendt Scholar in Political Economy at the American Enterprise Institute and formerly a Visiting Fellow at the Harvard University Center for Population and Developmental Studies. So, comparing the 1998 infant mortality rates for Switzerland and the U.S., 4.8 and 7.2 per 1,000 births, respectively, is comparing apples and oranges. Other countries, such as Italy, use different definitions in various parts of their own countries. Eberstadt observes that “underreporting also seems apparent in the proportion of infant deaths different countries report for the first twenty-four hours after birth. In Australia, Canada, and the United States, over one-third of all infant deaths are reported to take place in the first day. …” In contrast, “Less than one-sixth of France’s infant deaths are reported to occur in the first day of life. In Hong Kong, such deaths account for only one-twenty-fifth of all infant deaths. Facts very often get in the way of propaganda. Likewise, infant mortality rates, adjusted for the distribution of newborns by weight, are about the same. It must also be remembered that advancements in technology and medical treatment mean that doctors in America are now able to save babies who, even twenty short years ago, would have perished from, for example, very low birth-weight (less than 3 pounds). Vulnerable infants such as this may indeed now live with the help of advanced medical care, while low-weight babies (less than 5.5 pounds) up until very recently had a mortality rate nearly 20 times higher than heavier babies (this according to the World Health Organization). These infant deaths now all count as infant deaths in the United States, though not in many other countries, whereas before, 20 or 30 years ago, they were in America called stillbirths – the determining factor being a certain length of life, however ephemeral. Paradoxically, American doctors’ ability to save the lives of more babies causes higher infant mortality numbers here than would be the case with less advanced medical treatment. Because of varying standards, international comparisons of infant mortality rates are improperly used to create myths about how the United States should allocate local or national resources. If we want to lower our infant mortality rate so it compares better with that of other countries, maybe we should bring our measuring into line with theirs to better determine the actual extent of the so-called “problem” (ibid). There is also the crucial question – and this is not just lexical hairsplitting – of what it actually means to be alive. Science defines life as “self-sustaining behavior.” Some countries, however, define infant life only as surviving outside the womb for 4 hours, or 48 hours, or 12 hours, depending upon the country. There are other types of measurements as well. The point here is not so much in what those specific measurements are, but simply in that they are. In the U.S., where the white population is less than 68%, and where infant mortality rates among blacks is more than 13.5%, it is certainly true that our infant mortality rates are more greatly affected than those of say Sweden. Imagine a racial makeup of Sweden. Or Germany. Or Norway. Or Iceland. Or Japan — none of whom cover preventive, pre-natal , or maternity under their standard health insurance plans. It may just be that in modern healthcare systems, the greatest difference lies in these innate and as yet unsolved physical differences between races. Jungle Orchid wrote: > this situation is expected to increase as ‘trickle down economics’ will gain a foothold again. That is an opinion to which I most certainly do not subscribe. Trickle down economics? Please! Let laissez faire reign, and you will see a(nother) deluge of innovations and breakthroughs that no socialized regime could ever dream of, let alone match. Jungle Orchid wrote: > now, am i a communist? not at all. i am not even a socialist. By definition, all communists are socialists, but not all socialists are communists. One is a socialist to the exact extent that one advocates government control of any given industry. That’s what socialism is. You may very well not be a socialist in toto, I don’t know. It doesn’t matter to me. But I know this from what you’ve written above: your views on healthcare are most definitely socialistic, by definition. Jungle Orchid wrote: > however i do believe it to be a government responsibility to ensure that healthcare at a reasonable cost is available to every citizen. Says who? And why? Don’t you know that governments can’t control supply and demand? Cost controls can only and inevitably lead to one thing: out-of-control costs. As a matter of fact, that is precisely why American medicine has become so very costly — because of mushrooming government regulations, cost controls, complex tax discrimination laws, and the licensing law monopolies. By calling for government to be responsible for ensuring healthcare at reasonable costs is calling for more of the exact same policies that have created the mess to begin with. Anyway, if you’re going to claim that government must “ensure healthcare at a reasonable cost” for everyone, how can you then stop there? Food and shelter are far more urgent to human life than medicine. Government must therefore provide that for all of us too. After all, the free market can never handle these crucial human needs. The private grocery stores and restaurants and all the abundance of food that capitalism has created, these are just an illusion. Government must ensure that we receive these basic needs at a reasonable cost, yes? Same with private houses, apartments, condos, even hotels and motels. We can’t trust the market to provide this. It’s too important. The big benevolent government must provide these basic human needs for us, just as they must do with healthcare. In fact, though, that is the most serious flaw in the thinking of those who advocate some government intervention in healthcare: once you concede that it is a legitimate function of government to “ensure” such a thing (which it isn’t), you can never again defend that government does not have a right to meddle in our private lives, because you have conceded the very principle, and so you no longer have any grounds left from which to defend against government invasion. In short, you have conceded the principle of rights. And yet as irrefutable as all that is, there is an even more fundamental argument against your position that we must each be forced to pay for one another’s healthcare. That argument is this: no one, not even the government, possesses the right to the life and liberty of any other human being, including the life and labor of doctors. Just incidentally, using the process of Reconciliation to ram through Obamacare was not only unlawful: it was blatantly unlawful, as one of the author’s of the Reconciliation process himself said — and this, mind you, was a fellow resounding in favor of Obamacare. our president will go into history as one of the great presidents the usa ever had. Barack Obama is a Lame duck now, and will be a one-term dud. He is Carter all over again. Forcing people to purschase private healthcare insurance is a crime. The “Green Jobs” are a government mirage, and his insistence on killing the American Economy in the manner of a vulgar keynesian will bankrupt the USA even faster than it has been bankrupted so far. mrs palin on the other hand will be known as the chief executive clown of the rep/tea party. Palin is a mainstream Republican – and will be something of a figurehead president if elected – if she does nothing it will an improvemnet from your current administration – I welcome gridlock. Anything that slows your bureaucratic class down. drawing the conclusion that our healthcare system is the best in the world is a simplification worthy of any tea party-ist. anyone claiming this has to be considered as being ignorant of the facts and as not having the foggiest idea of the reality outside the usa (where people live longer). Living in Ontario, which has had a singe payer system for over 40 years now, I can tell you it is not a panacea. healthcare in america is excellent for those who can afford it. Fallacy – I guess you mean that everyone who is on medicare and Medicade then – McAllen Texas has the highest health care costs in America, but with one of the lowest average incomes. More socialism won’t make your system better, it will make it worse. With our aging population that will increase costs and below replacement rate birth rates that is reducing the number of potential productive and taxpaying members of society, Governments will only have two choices – raise taxes and/or fees for serivces or put on even more price controls and rationing of care than they already do. at best the not-so-rich are getting average healthcare with a lot of medical mistakes unheard of in the other developed countries. Obama believe in Trickle down economics – he is just in favour of the Government spending doing the Trickling. If you read the New Yorker article you will find that the Poor and old also recieve the very best care – all covered by your socialised medical system. Didn’t know you had one? Do some reading into the Fascistic/Welfare Statist“Great Society” project of LBJ. As Thomas DiLorenzo puts it. Friedman concluded that “Gammon’s Law,” named after British physician Max Gammon, “has been in full operation for U.S. hospitals since the end of World War II.” Gammon’s Law states that “In a bureaucratic system, increases in expenditure will be matched by a fall in production.… Such systems will act rather like ‘black holes’ in the economic universe, simultaneously sucking in resources, and shrinking in terms of … production.” Dr. Gammon surely knew what he was talking about, having spent his career in the British National Health Service. “The U.S. medical system, in large part, has become a socialist enterprise,” Friedman ended. Friedman also once suggested a syllogism to explain the bizarre spectacle on display today of responding to problems caused by healthcare socialism with even more healthcare socialism. now, am i a communist? not at all. i am not even a socialist. however i do believe it to be a government responsibility to ensure that healthcare at a reasonable cost is available to every citizen. that does not mean that healthcare has to be provided by the government..
Ray already answered this one quite well, but I might add that you should do some reading into the fallacies of Central Planning and the Inability of Socialists to calculate economic costs. Far from it – it is criminal, and will help to multiply the number of bureaucrats in your government exponentially – the last thing you need. and our president is the first person to recognize that the law needs some serious tweaking. Come again? may I ask your age? I wouldn’t be so quick to slam anyone for being ignorant. it is so easy to use slogans to manipulate the ignorant masses. Were you speaking of this one? of this one?